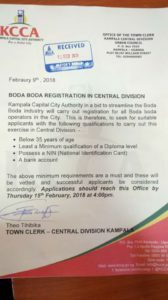 KCCA notice calling on people to enroll to carry out the boda boda registration exercise. 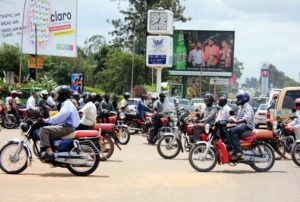 As a measure to streamline the boda boda business in the city, Kampala Capital City Authority(KCCA) has announced that it will conduct fresh registration of the motorcycles and riders. Though it is not indicated when the exercise will kick off, today KCCA issued notices at the five city divisions, seeking to recruit individuals below 35 years to handle the exercise. Also, they must have at least a minimum qualification of a diploma in any field and holding a valid Identity Card. Two sources at City Hall have intimated to PML Daily that the exercise should be complete before Easter holidays. “It’s going to be hard task but we hope, by Easter holidays, we would have completed. What’s more important is educate the operators so that they appreciate and turn up in big number,” a source said. In 2013, KCCA was able to register only 60,000 riders. The exercise faced stiff resistance mainly from the riders and politicians. Kampala minister Bettie Kamya recently revealed that they have to register the boda bodas because she is receiving several complaints over misconduct. Last month, a committee was set up to oversee the registration process. Kamya told PML Daily that KCCA is in partnership with the security ministry to come up with the regulations, which will govern the business. “We have to carry out fresh registration. Only those registered will be allowed to operate in the city,” she explained. Though they are not gazetted, PML Daily, through its sources was able to access the proposed regulations. One of the regulations stipulates that all commercial boda boda cyclists will wear uniforms and helmets for easy identifications. And each city division will collect its own revenue. These regulations were once fronted by KCCA executive director Jennifer Musisi, but they were not implemented. The embattled Abdullah Kitatta and his Bodaboda-2010 Association fought hard in 2013 and KCCA found itself in weak position. Kitatta is currently facing charges in the military court over possession of military weapons. Kamya accused Kitatta, of sabortaging the registration. At 32nd Liberation Day of NRM in Arua, President Yoweri Museveni condemned bad road users, especially boda boda cyclists in the city, who he said scare away foreign investors. Boda boda riders on jinja Road in Kampala recently.